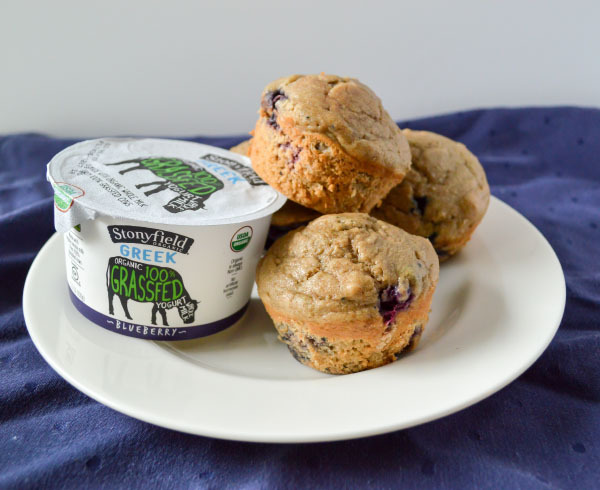 Sprouted Wheat Muffins & Stonyfield B Corp Announcement! This post is sponsored by Stonyfield. As a Stonyfield YoGetter, I am compensated. All opinions expressed are my own. Today, I have a delicious sprouted wheat muffin recipe to share with you – but first and more importantly, I have an exciting announcement to share on behalf of Stonyfield! As I’ve discussed before here, sustainability matters to me. I enjoy the outdoors and care about the future of our earth and its inhabitants. The more sustainable a company is, the more likely I am to shop there. Social responsibility also matters to me. When we visited Theo Chocolate last week in downtown Seattle, they talked about how they ethically source their cocoa beans and pair fair wages to their workers. Meanwhile, other large chocolate companies have relied on child labor and distance themselves from the unfair wages and poor working conditions of their bean harvesters in South America and in Africa. Living in a global society makes our world even smaller. The foods and clothing that I purchase here in America were harvested or created by someone who could live on the other side of a globe. No one should have to receive unfair wages so I can buy a piece of clothing or eat some chocolate. People matter – regardless of where in the world they live or what job they work. That all business ought to be conducted as if people and place matter. As consumers, we can help create the world we want to live in through our dollars. Just as shopping fair trade is an action for paying fair wages, shopping from B Corp companies is standing with the belief and practice that people and places matter more than profits alone. You can read more here about why B Corps matter. I firmly believe that people and places matter and that how I spend my money reflects that. I’m not always perfect about it, but I make a deliberate effort to shop from companies that uphold sustainability and social responsibility – including Stonyfield. As a Stonyfield YoGetter, I am super excited to share Stonyfield’s announcement today that Stonyfield is a certified B Corp! This means that in addition to providing high-quality, delicious yogurt, Stonyfield conducts their business with sustainability and social responsibility as a top priority. As Stonyfield explained, “At Stonyfield, we think about the impact of everything we do–from what’s in the cup and how it’s made, to how it gets to you. We’ve been on a mission to create food that’s good for us, our kids and the environment all along.” You can read more about why Stonyfield chose to become a B Corp and why it matters here. To celebrate their B Corp status, Stonyfield teamed up with other B Corps to send out a gift their ambassadors. I received some Stonyfield’s NEW grass fed Greek yogurt. If you haven’t tried Stonyfield’s grass fed yogurt, let me tell you now that it is the best yogurt I have ever tried. And you can enjoy this yogurt knowing that the cows were raised in a sustainable way, as grass fed cows are far more sustainable and create more nutritious products than grain fed cattle. I also receive a Sprouted Wheat flour from King Arthur Flour. Yes, sprouted wheat flour! Sprouted grains are popular right now for their high nutritional content and ease of digestibility and now you can easily make your own sprouted grain bread at home (which you know I’m excited about). 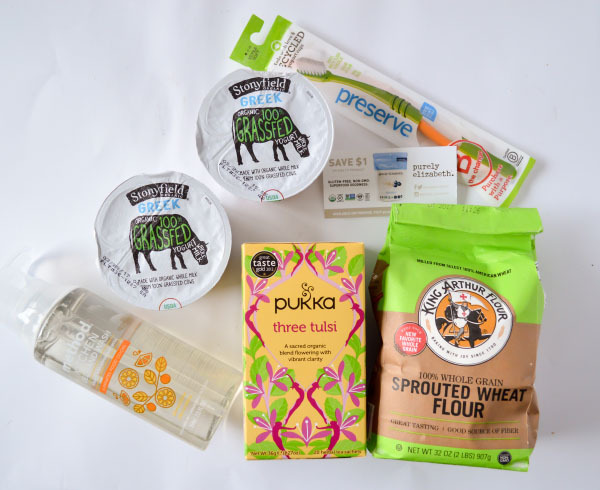 The other gifts from B Corp companies included a Preserve Recycled Toothbrush, Pukka three tulsi tea, a coupon for Purely Elizabeth granola, and Method hand soap. Pete & Gerry’s Eggs are also B Corp that partners with Stonyfield to provide delicious and sustainable eggs. To celebrate Stonyfield’s B Corp certification, I made you some sprouted wheat muffins using Stonyfield’s organic yogurt and King Arthur sprouted wheat flour. 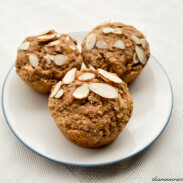 The sprouted wheat tastes fantastic – Ryan said these were the best muffins I’ve ever made. The texture is fluffy and soft, exactly how a good muffin should be. 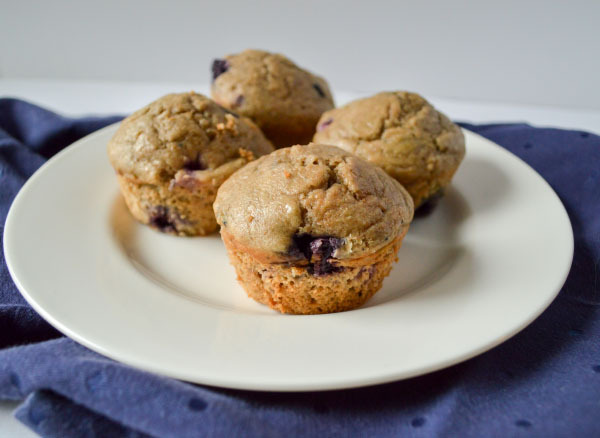 These sprouted wheat blueberry muffins are also lighter and more nutritious than normal muffins. Instead of using butter and sugar, I used a small amount of coconut oil, Stonyfield whole milk yogurt, and pure maple syrup. And, because I’m obsessed with all things blueberry right now, including that Stonyfield grass fed blueberry Greek yogurt, I added some frozen organic blueberries. In a small bowl, whisk together 1/4 cup (2 oz.) of the yogurt with the milk. Let sit for 5 minutes to create a buttermilk-like mixutre. In a mixing bowl, whisk together the remaining yogurt (6 oz. ), maple syrup, and coconut oil. Then whisk in the eggs. Once the eggs are incorporated, whisk in the milk-yogurt mixture, vanilla, and cinnamon. Add the flours, baking powder, baking soda, and salt, and gently fold into the wet ingredients. Add the blueberries and mix in with just a couple folds. Be careful not to overmix - some streaks of flour are okay. Grease the muffin tin with coconut oil or butter, or line with paper liners. Evenly divide the batter between 12 tins. Cook for 20-22 minutes, or until an inserted toothpick comes out clean. Let cool in the pan, and then store in an airtight container lined with paper towels for 3-4 days. You can also freeze these muffins for up to 4 months. *You can use unsalted butter as a substitute. I used Stonyfield Organic Whole Milk Plain Yogurt since the grass fed yogurts in the shipment contained fruit flavorings. You can use their grass fed plain yogurt, but I do not recommend using any type of flavored yogurt. 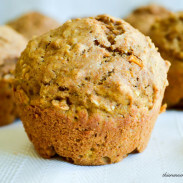 This recipe creates a less-sweet muffin – truly a quick bread, not a cupcake in disguise. I used 3 oz. (⅜ cup) for maple syrup, but you can use a 4 oz. (½ cup) if you prefer a sweeter muffin. I measured the flour by weight. If you do not use a kitchen scale, lightly spoon the flour into your measuring cup rather than scooping with the cup for a more accurate measure. Have you heard of B Corp? How do you choose the companies you purchase from? I’ve never heard of B Corp but thats great that Stoneyfield became one. These muffins looks delicious! Thank you! It’s surprising how many companies are B Corp – I had heard about them before, but never realized how many there were. With Stonyfield’s announcement, this was the first time I had heard of B Corps. I was thrilled to know that a ton of the products we regularly buy are from companies on the list. And these muffins? Give me all the blueberry things right now! I was thrilled at that also! I was even so excited to open the box and see that King Arthur flour is one of the companies because I use their flour. I had no idea what a “B corporation” was and, as a Yogetter, I’m super excited by the news!! 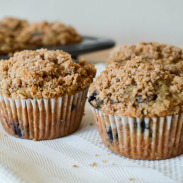 I agree with you that a blueberry muffin is the perfect way to celebrate! Congrats, Stonyfield! 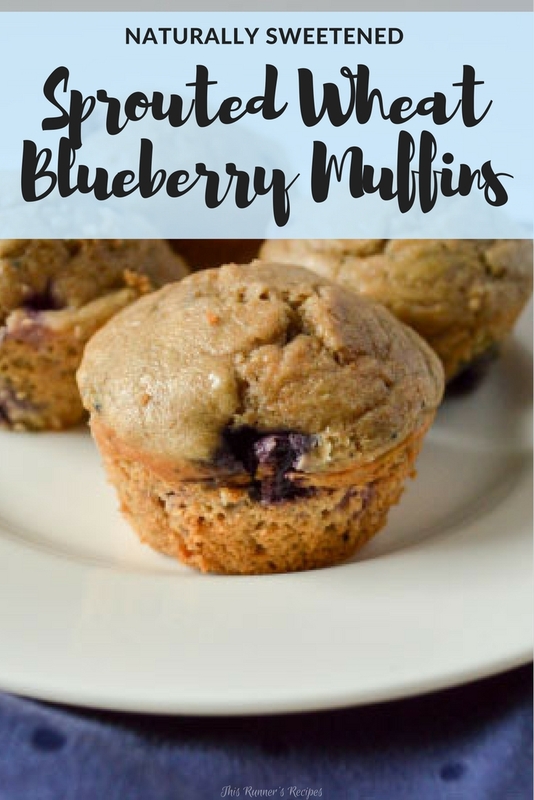 Blueberry muffins are such a good treat! I love stoneyfield products and these sound delicious! I had a question though; in the recipe directions it mentions baking soda but the list of ingredients doesn’t. Is there baking soda in the recipe and if so how much? Hi Erin! Thank you for catching that and I apologize for the error. I fixed the recipe to reflect the appropriate measurements: 1 teaspoon baking powder and 1/2 teaspoon baking soda. Awesome thanks! Out of curiosity does the sprouted wheat flour taste any different? It tastes different than whole wheat flour – lighter in both texture and flavor, but still slightly nuttier and more flavorful than all-purpose. I always loved stonyfield yogurt the best! and I need to experiment with sprouted wheat flour, I can start making my own Ezekiel bread I bet. I want to try the sprouted grain with my sourdough started tomorrow! We made pancakes with it and it tasted so good in those. I love using yogurt and sour cream in muffins and breads. It makes it so moist! Yum those morning glory muffins taste so good! I haven’t baked these with 0-2% yogurt but in my experience with other baked goods, it yields a similar product. The sprouted wheat and whole wheat are a 1:1 substitution so the result should be the same.